November online challenge is Cutlery. It is a great opportunity to experiment and apply the workshop on still life. Cutlery: an everyday object, and some say the pinnacle of civilization. Show us something new and different. How: Some ideas to explore is the use of shadows, number of objects in the pictures, or potentially focusing on the details. I'm breaking the rules. I ended up at the oldest surviving Surgical theatre in London (after getting the wrong bus). 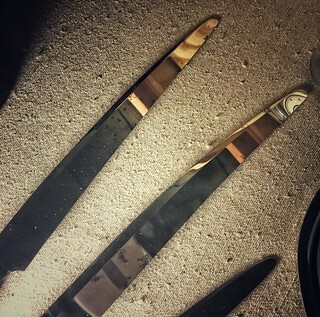 And I spotted these, amputation knives. I had an idea to combine the cutlery challenge with the parks one I never managed to do. So a few weeks ago I spent a lunchtime over at Park Hill trying to get something, but the light was poor and I didn't come away with any shots I was happy with. I was intending to go back and try again, but since that hasn't happened I figured I would at least post a couple of the attempts - if anyone else wants to give it a try (or use the idea in another setting) then go ahead - would be nice to see it done successfully. Peter Boughton wrote: I had an idea to combine the cutlery challenge with the parks one I never managed to do. What didnt workfor you Peter? I like this! Ohhh, I like. I especially like the first picture; see the world in teaspoon. Points on out the box thinking. I will second (or should that be third?) Laura's and Sarah's comments, Peter. I can understand why you were not entirely happy with your first attempt, but these shots demonstrate an originality which is often lacking in club photography. But then, you always have shown that you are willing to try something different. I also appreciate your generosity in sharing the idea while you are still experimenting. A spoon might just become an essential compositional accessory. Do not leave home without one! Laura wrote: What didnt workfor you Peter? A couple of things were bugging me, the softness/lack of detail and the specific scene/composition - I wanted more than just a single tree, but it was muddy and too many people around in the wrong places. The first image isn't as bad as I had thought, but I didn't realise at the time and that's the only shot I have like that. The second one might have worked better had I rotated the spoon 90 degrees - again, hindsight etc. I was using my compact, but definitely needs a greater depth of field and dynamic range, so next time I'll use my SLR. I was also shooting partly hand-held, will have to work out a suitable method of holding things in the right place, but that's easier with an SLR too. Peter Boughton wrote: Thanks all. I like the softness, which I felt complemented the type of reflective material. But I also see the potential in being able to single out a tree, or even a person. You dont think shallow DOf is best for this? Maybe as it is experimental, we/you should try and do both versions sometime! It really is great that you shared the results, especially as you did not have many takes. Did you say were you took the pics and I miss that detail Peter? I see the images were taken in Park Hill, I dont think I know where that might be - but I guess it doesn't matter ! !